Knights of Creativity Spirit & Ale: Be Merry! The conversation quickly turns to religion, politics, and… Ice Cream (at least when women are involved). Last night at a group dinner, one topic lead to another which lead to someone asking “Remember Merry Mobiles?” A few of us did; most did not. When I was a kid, one of the summer pleasures was the sound of a bell clanging down the street. That bell signaled one thing: ICE CREAM! Now, I know that ice cream trucks are not that unusual. The ones that rolled down Taft Ave. and many other U.S. streets were. I present The Merry Mobile! 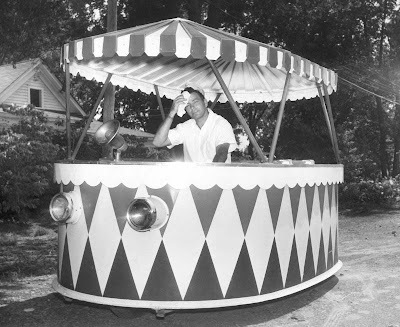 The Merry Mobile served Dreamsicles, Drumsticks, Red White and Blue Rockets, Lemon Ice Box Pie, Sky Blue Popsicles, Root Beer pops, orange sherbet Push-Ups, and many other frozen treats to melt a kid’s heart. Merry Mobiles operated from the mid-195s until the early 1970s. They were powered by one-cylinder engines, and the ice cream was kept frozen by dry ice. Unfortunately, these were replaced with more efficient, yet more mundane, modes of transportation. Most of the Merry Mobile fleets were destroyed for scrap. 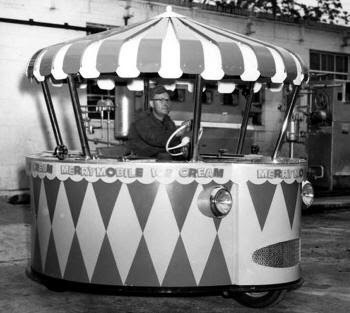 This image is from Lickety Split Ice Cream -- the proud owner of a completely restored original 1950's Merry Mobile ice cream car and operating in Memphis, TN. Brilliant...seeing one of those beauties as a kid in the USA , must have made an indelible memory for life. My Father , of course, made us kids believe that when the music played this meant the van had run out of Ice Cream. I sense a theme - an orange theme! The ice cream man is coming! The ice cream man is coming! I remember the Merry Mobile riding down Taylor. Kids scrambling for change from their parents. Running towards the round beast. Clambering up the side to get to an ordering height. I don't remember what I ordered. Push-ups probably. It's unfortunate that my childhood memories are now replaced by a distrust of the intentions of some. may become my newest life motto! 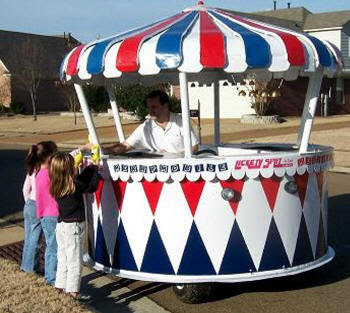 I would have to go buy ice cream from this contraption. Never seen one before today. Born in 1969. Want a dream cycle little girl? So, keep me away from the Merry Mobile! LOL! Agreed on Sir James...great concept...looking forward, glancing back. Like driving while looking in the rear view mirror...always seeing where you're going and where you've come from. Of course, Sir D would call this impossible, because "you have to live in the now"! Today may be all there is so live it, love it and carpe diem! who's wondering if my sister-in-law reads this blog??? ?